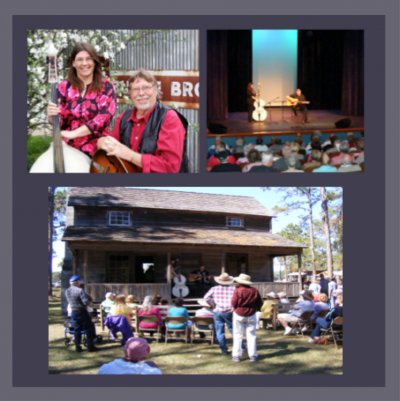 Join us at the Maquoketa Art Experience on June 8, 2014 at 1:30 pm for the “The Smithsonian Traveling Museum of Music,” featuring Bob and Sheila Everhart (Grammy nominated Smithsonian recording artists). The Everharts have conducted a huge number of concerts all built around the historical aspect of America’s early music on the frontier – music of the settlers and homesteaders of the Great Plains and prairie. The Smithsonian calls their concert a “Traveling Museum of Music.” Their songs and the manner in which they play them reflect the true American innovative method of oral tradition, with their own creativity blended in. These Smithsonian Institution recording artists have become one of the most “in-demand” acts of this nature in the upper Midwest and have received tremendous accolades and honors from their peers as well as international fans. They are listed with the John F. Kennedy Performance Arts Center for special Diplomatic Corp. presentations as well as Governmental programs. They record for the prestigious Smithsonian Institution, located in Washington DC, with six successful projects released on the Smithsonian-Folkways label. One of those, “Time After Time,” was a Grammy nomination. Bob worked closely with and became a lifelong friend of Moses Asch, the founder of Folkways Records in New York City. He also befriended Marjorie Guthrie, widow of Woody Guthrie, who became a fan after attending Everhart’s old-time music festival. She gave Bob an old guitar her husband Woody once played, now on display in their Pioneer Music Museum. Bob and Sheila recorded an additional six successful CDs for Prairie Music Records, with re-releases on Condor Records in Canada, and numerous labels in Europe. The Everharts have performed their one-of-a-kind show around the world, from China to the North Pole (Bob was on an Arctic-Dewline Replenishment Expedition). Bob also served as the radio station manager of KJNO radio in Juneau, Alaska, for three years. He produced, hosted, and performed on the PBS national television show “Old Time Country Music,” for seven years. He produced and performed on a syndicated radio show called “The Old Time Music Hour” to a large group of radio stations in Iowa and also produced and performed on “Bus Stop” a locally produced television show taped in an old-time cafe featuring old-time acoustic music. Attend their concert, enjoy yourself, and find unique, rare entertainment that can only come from the “real” country. You won’t be sorry!